The "White Horse Prophecy" is supposedly a prophecy made by Joseph Smith, the founder and first prophet of The Church of Jesus Christ of Latter-day Saints. It has been cited in news media as the source of a prophecy that Latter-day Saint elders will preserve the U.S. Constitution as it hangs by a thread. It is commonly claimed that the white horse prophecy was written and made public among Latter-day Saints in the 1850s. A recently published BYU Studies article by Don Penrod shows that it was written around 1900 by Edwin Rushton, a Mormon living in Utah. Brigham Young (in 1854) and Eliza R. Snow (in 1870) reported that Joseph Smith once said that the U.S. Constitution would hang by a thread, and other Latter-day Saint prophets and apostles referred to the prediction. It appears that other predictions in the "prophecy" are not from Joseph Smith, but are embellishments. The supposed White Horse Prophecy contains references to various forces involved in conflicts, certain countries, and certain leaders, which could be embellishments written by Rushton. The alleged prophecy is not a reliable record, says Penrod, and it has been officially repudiated by the LDS Church since 1918. 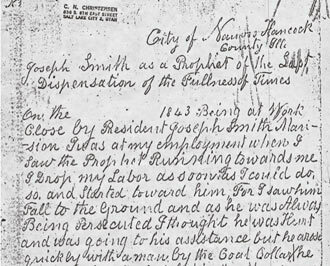 Prophets John Taylor and George Albert Smith both experienced visions (not recorded in LDS scripture) that revealed future unrest in the United States. The New Jerusalem, or Zion, would be established during this period of unrest with its center in Jackson County, Missouri. The constitution of Zion would be the Constitution of the United States, and therefore, the Elders of the Church would be upholding and saving the constitution of the United States no matter what its condition in the hands of the federal government. Most Latter-day Saints, perhaps because of this prophecy and the retelling of this specific idea from the prophecy, are vigilant and concerned about the respect for and upholding of the U.S. Constitution and the views of the founding fathers. Most Latter-day Saints desire to uphold the original goals of the document. (See Constitution of the United States.) Mormons view the U.S. Constitution as a divinely-inspired document, and Mormon scripture reveals that the Lord raised up the American founding fathers in order to produce it. Click here to read an article regarding the White Horse Prophecy. This page was last edited on 14 December 2010, at 13:10.